The Colonial Theatre is a historic performing arts center which brings the cultural and creative spirit of our community to life. The Colonial Theatre will be the model regional performing arts center... exciting, educating and challenging audiences of all ages. The Colonial Theatre first opened its doors on January 29, 1924. Located in the heart of the city on Main Street, it quickly became a focal point for the arts. Owner Charles Baldwin proudly called it "New England's most modern and perfectly appointed theater." 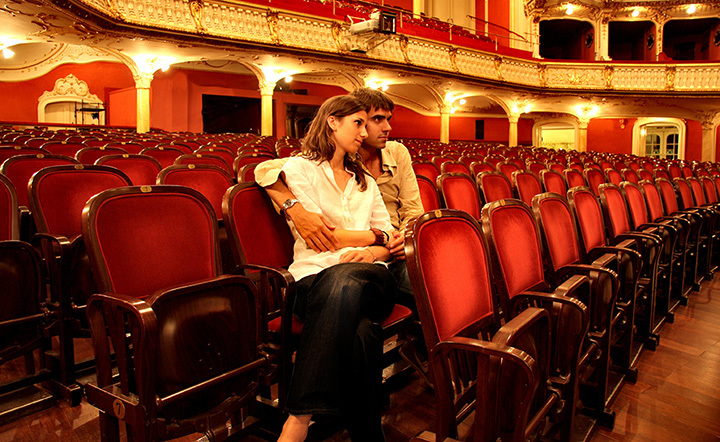 Over the years, the Theatre has hosted movies, vaudeville shows, operas and numerous community events. Some early highlights were: Metropolitan Opera star Rosa Ponselle singing four encores of “O Sole Mio”; Thornton Wilder reading from The Women of Argos; Amelia Earhart lecturing on the possibilities of cross-Atlantic air travel; and Maude Adams performing Shakespeare's Twelfth Night. By 1945, almost 20 years after opening, the stage no longer held actors in pursuit of their craft as it had done so proudly for the previous sixteen years. Instead celluloid movie stars captured the attention of audiences, and the majesty of The Colonial began to disintegrate over time. By the early 1990s, it looked like the only remaining historic theater in Keene might not survive. In 1991 a small group of devoted Keene citizens decided that The Colonial Theatre must be saved. By 1993 they had established the theatre as a non-profit group and begun to articulate a mission. Their efforts resulted in hiring an administrative staff and obtaining $2 million from grants and private donations from the community to begin infrastructure renovations. By March 3, 1995 the restored hardwood stage was in use once again. Since that time more than 350 live performances have entertained and enlightened audiences of all ages. Award winning films are shown nightly on the largest state-of-the-art movie screen in the region. In 2004 The Colonial Theatre was placed on the New Hampshire State Registers of Historic Places. As we begin our second decade as a not-for-profit organization we are proud to continue the tradition of excellence for which The Colonial is known.